The East Village, a lasting legacy for London. Communities Secretary Eric Pickles has seen the vision of the future Olympic Park which will provide thousands of much-needed new homes for residents in the capital after the 2012 Games. Mr Pickles opened the ‘East Village - a lasting legacy for London’ exhibition and saw for himself the housing designs for the East Village, the legacy for the Olympic Athletes Village site. The exhibition, hosted at New London Architecture, showcased the designs created by Qatari Diar Delancey (joint partnership between Delancey and Qatari Diar Real Estate Development Company) and Triathlon Homes (a joint partnership between East Thames Group, First Base and Southern housing Group) who are the collaborative team behind the project. With the Olympics set to be delivered on time and on budget, the next, important challenge is to produce a lasting, living legacy for East London and the provision of 2,818 new homes is a significant milestone to ensuring this is achieved. 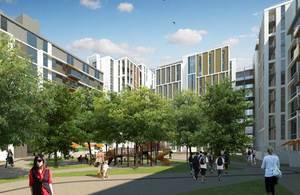 With half being allocated for social housing, the development offers affordable homes with choice of buying or renting to people with a range of income levels and allows the local community to take ownership of the Olympic legacy. Mr Pickles also explained to the audience that he had taken further steps to allow the Mayor of London to create the London Legacy Development Corporation which will take forward regeneration in the Olympic Park and in the surrounding areas of East London. The corporation has further plans for the Olympic Park including the building of further new homes and associated job creation. “The Olympic Park represents the most significant regeneration project of the next 25 years. The government is ensuring there is a lasting legacy from the Games and the innovative and attractive architectural designs on display here highlight the commitment to that ideal.